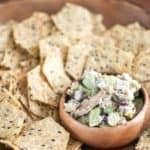 Crab, creamy avocado, and Goddess dressing make a quick crab and avocado salad topping for crunchy and nutty multigrain tortilla chips! Serve this quick dish as an appetizer or your lunch! Mix all the ingredients, minus the chips, in a bowl.